Elements 7 represented a big first for Adobe. 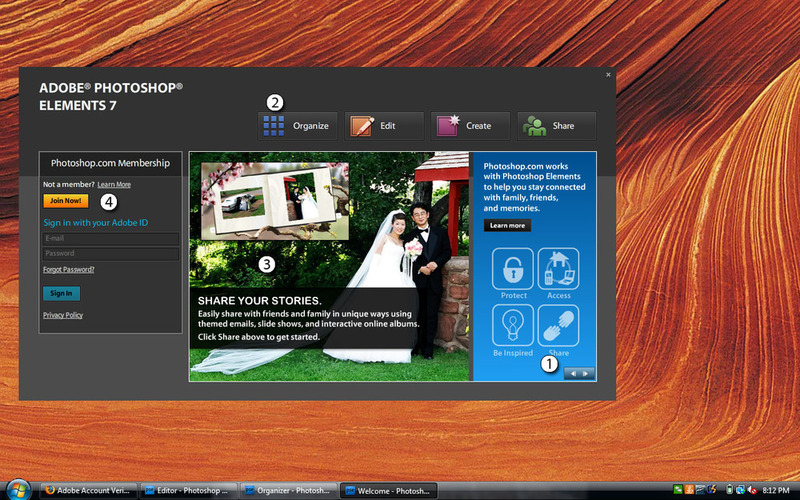 This release was the first time Adobe has offered a “hybrid” application experience: desktop software shipping with integrated hosted services from Photoshop.com. This new application model presents challenges from a user experience perspective. Where does the user sign in for services? How do I sign up? How do I manage my account? How do I import photos? Where can I find out about new or expanded service offerings? The welcome screen fills all these roles, becoming the single point of entry into the Elements Application experience without requiring the user to exit the application and enter a web browser. Users can navigate between informational pods, which are updated dynamically from online. This Allows Adobe to push new content into the Welcome Screen as services change between releases, new tutorial content comes available or creative content is released. Static application launch buttons for the main application workflows. This helps the user get to what they want to accomplish without knowing exactly where to start. Dynamic, flash based content allows for a richer, more nuanced application experience. Authentication pod for existing users to sign in, or for new users to create a services user account.